I've said it before but it's still true. My tiny scrap bag holds an endless amount of scraps and strings. Even though Chinese Coins XI was intended to empty it, the bag looked just as full as always. More sewing was required. Arranged in columns, these do nothing for me. Not good or bad, just very boring. What else could they become? They'd make good borders for a medallion but I finished several recently. However, I keep considering sashing. Now would be a good time to actually try that. Since solids are the largest section of my stash that hasn't been worked with, I pulled some pretty sherbet colors. Encasing five Coin columns with a different color, I sewed them together, added two rows of tulips above and below. Is it still a Chinese Coin quilt? Well, since I started with Coins and sashing is the traditional way to make a Coins quilt, I'm counting it as such. Chinese Coins XII quilt! It's also an overdue baby quilt for someone special. What a sweet baby quilt this will make! Thanks. I think it's a wonderful baby quilt. Fun, lots of color, and not too precious to use. I actually like the layout on XI. I like the randomness of it, but as you are evolving coins quilts to another level, I can understand why you think it is boring. The baby quilt turned out so cute! I like the layout, Patty, but it seems so similar to the previous quilt and I'd rather try something new. Like you, I need to rebuild my baby quilt stash so this is a better solution. Definitely still a coins quilt - and a really pretty one! Thanks, Julie. It's delightful to find another variation. I like all the sherbet colors. They do. Especially with a "double" sashing. Since I need several soon, it's good to have them coming along. Great design and happy colors! Just right for a little one! Babies are as happy and pretty as these colors. I was pleased how this turned out since it was completely "seat of my pants" designing. I love your idea of framing columns of Chinese Coins. A winner. The tulips top and bottom are just perfect. I hadn't used the tulip fabric so I've been cutting it for the Coins. This is the absolute last bit. Not enough to go around all sides and that turned out even better. Sometimes we get lucky. You amaze me with what you come up with. I didn't know that there were so many ways to do a Chinese coins quilts. I'm sure you've got a few more up your sleeve. I never make a dent in my scrap bins either. Makes me wonder how many quilts they contain. Your baby quilt turned our so sweet! This emptied mine for about a millisecond. By the time the first top was done, there were several new scraps in it. Now it's about a quarter full again. And so it goes. This is fun, too! I really, really like the lime green striped border. Just curious -- did you deliberately put the top/bottom borders on first and then the sides? Thanks, Nann. Yes, I did so the tops and bottoms don't line up across their horizontal seam line. It made it more difficult because each section had to measure perfectly rather than trimming off the top/bottom. 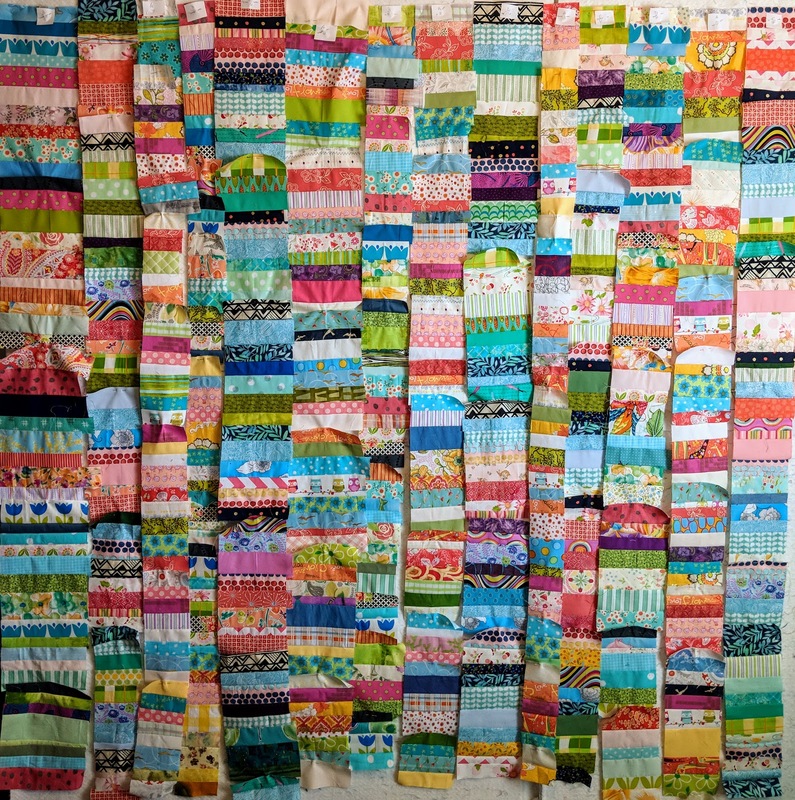 A less experienced quilter should sew long sides first then add short ends. Didn't those tulips turn out wonderfully. I love finding weird fabric in my stash that fits perfectly. A neat baby quilt, and I agree with Audrey on the border tulips. Thanks again, Maureen. I'm so thrilled with that fabric. If I hadn't pulled for scraps I wouldn't have used it as a partial border. Wish I had more now. Yes. Make a quilt, Preeti, because yours are so lovely. Thanks for the compliments. I really like this with different sashings. That's not something I have considered. I also like the idea of using the sashing fabric to enclose the coins. Better to keep them contained so they don't get lost or stolen! 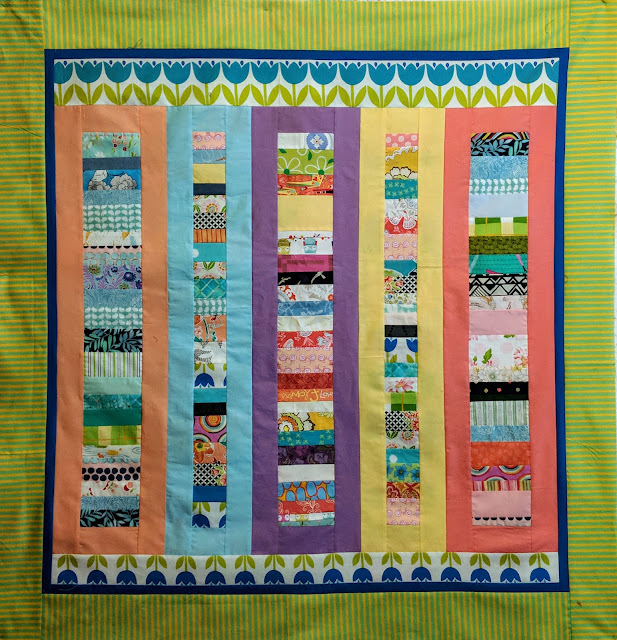 I have made a coins quilt with sashing, and called it a coins quilt. I think this is a more traditional layout for Coins that my others. So after all my improvising, I'm back to the traditional arrangement. Go figure.